During their last hike of the week, four middle school girls showed off their survival skills when they came across a small “crashed” plane and one of their “injured” counselors. The girls were told their plane had crashed in the woods, counselor Dani Derringer was injured, and they needed to work together to survive while they waited for help to come. The simulation was the culmination of a weeklong camp, called Girls Empowered at Mountain Shepherd, that taught the girls survival skills and how they can be applied to everyday life. Mountain Shepherd Wilderness Survival School is on 100 acres in Craig County. Most of the property is forest, with an outdoor classroom located about a quarter-mile down a trail. Campers can sleep in bunks or in tents on the property. GEMS was the brainchild of Dina Bennett, who teaches a January-term course at Hollins University called Survival for the Modern World. She and her husband own Mountain Shepherd and teach a variety of survival courses there. She connected with one of her students, Kayla Deur, and together with Derringer, who teaches high school math, they began to develop the idea for the camp. All three women felt strongly that it should be just for girls. “I think it was a natural decision to do it just for girls, because boys, in my mind, have this opportunity and this experience a lot more often,” Deur said. The girls learned about the seven priorities of survival, a list of the most important things to take care of if stranded in the wilderness that includes first aid, fire building and signaling. On the first day, they learned how to construct a shelter with just rope and painter’s tarp. Over the next two days, they learned how to build a fire, first with man-made materials and then with pitchwood. Jordan Jennings, 12, of Salem said building a fire was her favorite skill to learn. Lily Webster, 12, who’s also from Salem, was torn between fire and shelter building. “I feel like I could have figured out a fire, maybe, if I had a lighter [and] if it wasn’t rained on. But building a shelter, I don’t think I could have figured that out,” she said. Bennett said the most important priority is having a positive mental attitude — or PMA, as they call it during camp. “If you are in a survival situation it is very important because if you are thinking negative about the situation that you are in, it’s going to cause you to do a lot worse choice than you would have if you had a positive [attitude],” said Allie Mitchem, 11, of Salem. These skills aren’t just for the wilderness. “We talk through things like bullying and use some of the hard skills they’re learning as metaphors for how to deal with those bigger social situations,” Deur said. With the girls gathered around her, Derringer spoke about how a positive mental attitude and first-aid skills can translate to everyday life. PMA, she said, is about making sure you’re OK before you focus on anyone else. Derringer said the camp can be transformative for the girls. 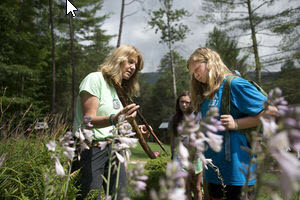 McKenzy Potter, 12, of Bonsack said learning survival skills has helped her. The camp also pushes girls out of their comfort zones. Part of the food-gathering lesson was learning which insects are edible and which are not. Both Jordan and Allie ate ants. But the camp doesn’t just use survival skills to teach confidence. On Monday, girls identified their superpower and their superhero confidence pose, which they struck throughout the week whenever they did something they were proud of. They also made capes with their superhero emblem. Bennett said it’s OK if the life lessons they teach don’t click right away. “It might come back two years from now, or next fall in the classroom, as they’re sitting there, and there’s an experience. It’ll click later. There’s that seed growing,” she said. When the survival scenario was done, the shelter was built, the fire was lit and “help” had arrived, the campers and counselors all struck their superhero poses. The girls had only a couple of hours left at camp, and as Bennett looked over the departing group, there were tears in her eyes.